Grout color - Can you please share the grout color? Thanks! Hi, Emilie! This was a while ago, but we believe it was a grey grout color. Who makes the flooring? - . No I believe it is a Handcrafted Subway tile. It is a very unique look more rustic great for a farm house look like this. The tile itself has natural inconsistencies and undulation on the surface, it is not your typical subway tile. Here on this picture you can see the undulation and characteristics that would have been present in Ceramic Tiles many hundreds of years ago by hand. It can be found online here. As for the flooring. That looks like a Cement Tile. 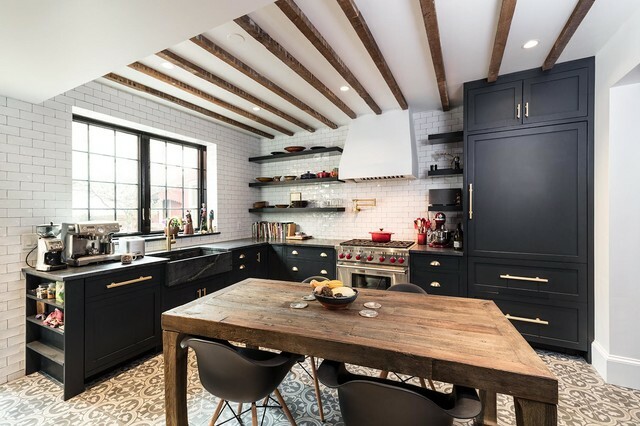 While not asked in the question, for anyone looking it does complete the look very well, especially with the wooden beams. It is difficult to see but my guess this is Tulips design on the top right. 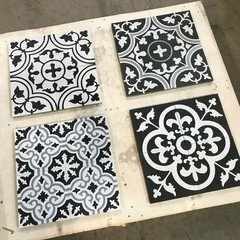 Handmade Encaustic Cement Tile from The Builder Depot. dying to know cabinet color and countertop info - please!! cabinet color and maker? - Hi, would you mind sharing the shade of black on the cabinets? what color is the grout? - . kitchen dimensions - Can you share? Pennies from Heaven . . . a faux copper vent hood.